For tonight’s USDF episode we are going to preview the national finals with Lisa Gorretta, we after that USDF volunteer of the year Lois Yukins talks to us about being involved in the sport, and we are going to bring you a trainer tip about half halts. Rider’s Balance author Sylvia Loch is interviewed, Philip and Reese review Christoph Hess’ Ride Better and Jodie Kelly talks about how the equestrian community is working to help animal and human victims in the aftermath hurricane Michael. This week 2017 Roemer Foundation/USDF Hall of Fame Inductee, Lilo Fore, joins us, and we have a excerpt of 2018 Adequan®/USDF FEI-Level Trainers Conference presenter, Johann Hinnemann. Lilo Fore, Santa Rosa, CA, is a recently retired FEI 5* and Para 3* Judge. She is a licensed USEF "S" and DSHB "R" dressage judge. Lilo is a founder of the USDF Instructor/Trainer Program and is the current chair of the Instructor /Trainer Committee and 2017 Roemer Foundation/USDF Hall of Fame Inductee. Johann Hinnemann is recognized worldwide as a trainer and coach, having served as Canada's team trainer and German National Coach, alongside Klaus Balkenhol. His student roster reads like a "Who's Who" of Olympic medalists and various national champions, including Steffen Peters, Coby van Baalen, Marlies van Baalen, Ulla Salzgeber, and Heiki Kemmer. USEF Senior dressage judge and L Education Program Faculty member Debbie Reihl -Rodriguez joins us to talk about flying lead changes and we have visualization exercises from part four of our series on the mind/body connection with Sandy Venneman. Debbie Riehl-Rodriguez, Arvada, CO, is a USEF Senior ('S') Dressage Judge, Registered ('R') Dressage Sport Horse Breeding Judge, and USEF L Education Program Faculty member. Debbie has also earned her USDF Bronze, Silver, and Gold Medals. Sandy Venneman PhD, Sealy, TX, is an experimental psychologist, with a lifetime teaching certificate in secondary education, Sandy combines psychology with 40 years experience riding to help equestrians reach their potential. Coaching riders in the use of psychology to improve their riding, she instructs and gives mounted and un-mounted clinics nationwide. This week we announce winners of USDF service awards and learn more about American Dressage Legend, Liz Searle. We have tips on lateral work from Lilo Fore, and part two of our series on the mind/body connection with Sandy Venneman. Liselotte (Lilo) Fore, Santa Rosa, CA, is a USEF "S" dressage and Young Horse Judge, a USEF "R" Dressage Sport Horse Breeding Judge, and retired FEI 5* Dressage and FEI 3* Para-Equestrian Dressage Judge. Lilo was a founding member of the USDF Instructor/Trainer Program and still serves an examiner and instructor along with being co-chair for the committee. This week we learn more about American Dressage Legend Fiona Baan. We meet Chase Shipka, winner of the Fiona Baan “Pursuit of Excellence” Memorial Trophy, and Sara Geikie educates us on riding and improving the walk. Sarah Geikie, Lebanon, CT is a FEI 4* Dressage and Young Horse Judge, USEF Senior ('S') Dressage Judge, USDF Certified Instructor through Fourth Level ,and Instructor/Trainer Examiner. Sarah also serves on the USDF Judges and Freestyle Committees. This week Instructor/Trainer Program Faculty member Kathy Simard joins us to discuss the importance of the consistency of aids; Senior Competition Coordinator Cristen Brown returns to talk about All-Breeds Awards; we have part 2 of the series on rider Biomechanics with Dr. Hilary Clayton and we learn more about American Dressage Legend, Lieutenant Colonel Hans Moeller. Kathy Simard, Littleton CO, is a USDF Certified Instructor through Fourth Level and member of the program's Training –First Level Faculty. Kathy is an L Graduate with Distinction and has earned her USDF Bronze and Silver Medal. Hillary Clayton BVMS, PHD, DACVSMR, MRCVS, Mason, MI, is an equestrian, veterinarian, author, researcher, and clinician, Dr. Clayton has conducted targeted studies on bitting, saddle fit biometrics, kinematics and kinetics, and locomotion. She established Sport Horse Science, LLC. and is vice president of the American College of Veterinary Sports Medicine and Rehabilitation. Dr. Clayton has been inducted into the International Equine Veterinarians Hall of Fame, the Saskatoon Sports Hall of Fame and the Midwest Dressage Association Hall of Fame. As a rider, Dr. Clayton has earned her USDF Bronze, Silver and Gold Medals. 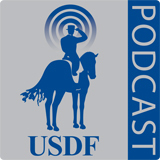 This week we have a special episode, which will focus on the USDF Sport Horse programs. 2017 USDF Sport Horse Prospect Development Forum co-presenter Michael Bragdell joins us to speak about the upcoming 2017 forum. Kristi Wysocki discusses the different sport horse education events taking place in 2017, and in the education segment, we have Coralie Hughes explaining the biomechanics of the gaits. Michael Bragdell, Colora, MD, is the Head Trainer at Hilltop Farm, where he trains and presents young horses in-hand and under saddle at breed inspections and competitions. Michael is also a USDF Certified Instructor through Fourth Level and has earned his USDF Bronze, Silver, and Gold Medals. Kristi Wysocki, Elbert, CO, is a USEF licensed ‘S’ Dressage and ‘R’ Sport Horse Judge with USEF and a FEI 3* Dressage and Young horse Judge, and 4* Para Equestrian Judge. Kristi is also Chair of the USDF Sport Horse Committee, a USDF Certified Instructor through Second Level, and has earned her USDF Bronze, Silver, and Gold Medals. Coralie Hughes,Coatesville, IN, is a Certified Practitioner of the Masterson Method of Performance Equine Bodywork. In addition to earning her USDF Bronze Medal, Coralie, is a German to English translator and co-author of the Dressage Movements Revealed DVD set and The Dressage Horse Optimized.